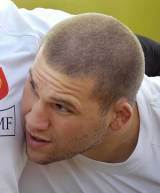 When Auch loosehead prop Fabien Barcella made his France debut against Italy in March 2008 he was one of five Test debutants in the match among a total of 12 in the first four games of Les Bleus' Six Nations campaign. Barcella started again the following week against Wales and won one more cap in the calendar year, against Argentina in November. He joined Biarritz for the 2008-09 season which enabled him to make his Heineken Cup debut against Gloucester at Kingsholm the same season. After impressing in France's November 2009 win over South Africa Barcella was struck by a series of injuries, missing their Grand Slam in the ensuing Six Nations. On the eve of the 2010-11 Top 14 season he was ruled out for six months with a ruptured Achilles tendon. Despite having an injury-disrupted 2010-11 campaign, Barcella found himself back in international reckoning come the summer and travelled to the 2011 World Cup with the national side.